Pro Football Focus’ Preview Team has come together to provide every fan with the right information to best prepare and enjoy Week 16 in the NFL. 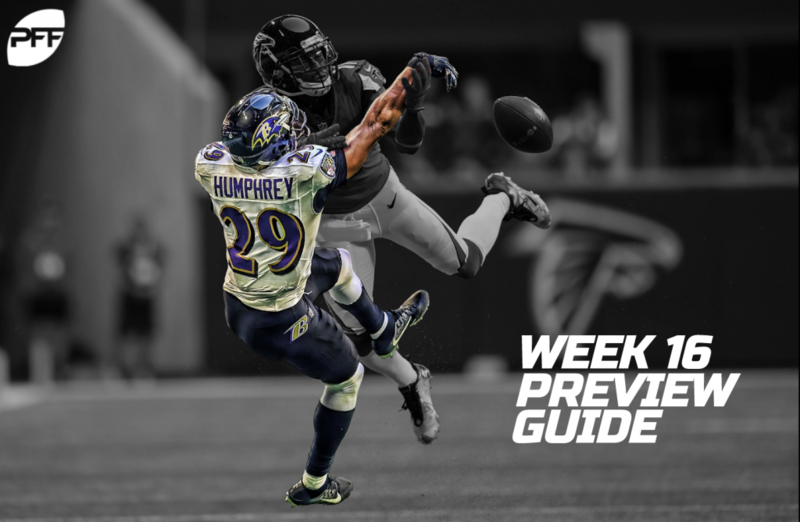 We offer advanced stats on key NFL matchups, fantasy advice and a Greenline perspective for all the weekend’s games and Monday Night Football. Derrick Henry has broken 18 tackles over the last two weeks. After being one of the biggest fantasy disappointments of 2018, Derrick Henry has caught fire over the last two weeks, leading all non-quarterback fantasy options in scoring. The stars continue to align for Henry down the stretch, as he’ll face a Washington defense that has allowed four of the last five backfields they’ve faced to top 100 rushing yards. Henry is an RB1 play in Week 16. Washington and Tennessee are both coming off of games that may or may not have set football back three decades, with the Titans winning 17-0 in New Jersey and Washington edging Jacksonville 16-13. The low total (37.5) is going to make it tough for either team to score enough points to win by two touchdowns, and hence we like Washington here despite all of their limitations. Rivers’ big-time throws rank seventh in the league. To Lamar, or not to Lamar. That’s the question many Lamar Jackson owners face this week. It’s a tricky matchup, as the Chargers give up the seventh-fewest fantasy points per game to opposing quarterbacks. However, we can’t treat Jackson like a quarterback for fantasy purposes. Sure, that’s his position designation, but Jackson’s fantasy upside is with his legs. He leads all quarterbacks in rushing yards with 564 entering the week. And it just so happens that the Chargers are a good matchup for the run game. If you’re on the fence about Jackson, be sure to consider the fact that the Chargers have allowed five rushing scores over their last three games. This matchup has about as much playoff leverage as the first game on Saturday but will likely be a good game. The Ravens are unconventionally moving the ball offensively with Lamar Jackson and Gus Edwards, and the Chargers are allowing early-down runs to gain success more than most of their peers. However, the Chargers are the best team in the AFC on early downs both passing and stopping the pass. This is the recipe for success in the NFL, and why we like the Chargers (-4) and the over 43 here. White’s 90 yards allowed last week were the most he’s given up all season. Julian Edelman has continued to be Tom Brady’s safety blanket in the short and intermediate areas of the field, and his target volume figures to increase follow the news about Josh Gordon. Edelman has seen double-digit targets in five of his last seven games, including Week 8 when he last faced the Bills. Edelman was as solid as ever in that contest, topping 100 yards and tying for second among wide receivers in fantasy scoring for the week. Cox’s 22 QB hits are the most in the NFL. Losing Will Fuller earlier this year certainly changed the dynamic in the Texans’ offense, but DeAndre Hopkins continues to play excellent football. He’s coming off a 10-catch performance in Week 15 where he ranked No. 1 in fantasy scoring among wide receivers. Hopkins figures to continue to roll against the Eagles. He’ll see his share of Rasul Douglas, who has seen a massive 23 targets thrown into his coverage over the last two weeks. Houston struggled with the Jets last Saturday, while the Eagles enjoyed their most impressive win of what has been a disappointing Super Bowl hangover season. One of the biggest mismatches of the week is the front four of the Eagles against the offensive line of the Texans in pass protection. If Rasul Douglas and Avante Maddox can continue to hold up on the back end, the Eagles can have some success here, which is why we like them to cover in this spot. Bradberry allowed 129 yards in their Week 9 matchup with Atlanta last season. Tevin Coleman was a big-time fantasy play last week, but be careful with your expectations for Coleman this week. Carolina has been tough against the run for most of the season with just two backfields topping 100 yards against the Panthers. Of course, it should be noted that Carolina has surrendered a rushing score to running backs in each of their last six games. However, only the Saints managed to go over 100 yards on the ground during that stretch. Coleman is best viewed as a back-end RB2. Garrett has registered at least three pressures in 10 of his last 12 games. Bad matchups and injuries have shaken up the quarterback position here in fantasy championship week. Those in need may want to fire up Baker Mayfield. The rookie has shown the ability to put up fantasy points this season. Better yet, the Browns are still in the playoff mix. But the icing on the cake is this matchup. Entering Week 16, Cincinnati is the No. 1 fantasy matchup for quarterbacks. Mayfield is a top-10 play this week. Vea is coming off the highest-graded game of his career (91.2 overall). Mike Evans has somewhat quietly produced an impressive statistical season. He enters the week second in the league in receiving yards and ranks 10th among wide receivers in fantasy score. But this could be a bit of a letdown week for Evans, as he’ll see his share of Byron Jones. The Cowboys defensive back is one of 2018 biggest breakout corners. Jones is yielding a stingy 51 percent catch rate with just one touchdown allowed in his coverage this season. Darnold is coming off the highest-graded game of his career (90.3). Entering Week 16, Davante Adams leads all wide receivers in fantasy scoring. He’s done so on the strength of a league-high 12 touchdowns to go along with 100 catches and over 1,300 receiving yards. Adams is poised to finish out the fantasy season with a bang with a plus matchup on tap against the Jets. He’ll see plenty of Morris Claiborne in coverage. The Jets corner is allowing a massive 15 yards per reception this season. This game opened as a pick ’em before Aaron Rodgers announced he was playing – moving the number to Green Bay (-3). This would be the Packers’ first road win of the season, and we like them to get it here and cover in so doing. Barkley’s 26 broken tackles after the catch are the most in the NFL. There’s a good chance that Marlon Mack helped propel you to a win last week in the fantasy semifinals. If that’s the case, continue to ride the wave with Mack. Unlike last week, Mack draws a very favorable matchup against a Giants defense that has allowed over 100 rushing yards to six of the last seven backfields they’ve faced. Wagner only played 28 snaps a week ago before leaving with a concussion. Adam Thielen has cooled off over the second half of the season and is coming off a fantasy dud in Week 15. But he’s in a great spot to bounce back against the Lions. Thielen will draw primary coverage out of the slot from Nevin Lawson. These two faced each other back in Week 9. While Thielen didn’t put up big yards in that contest, he did find the end zone. Look for Thielen to have a productive day as the Vikings are fighting for their playoff lives. Larsen’s 93.1 pass blocking efficiency is second-worst among guards. Frank Gore’s injury last week opened the door for rookie Kalen Ballage, and he exploded through it. Ballage entered the game with just 11 rushing yards on the season and went 10x on that total with 123 yards on 12 carries. He figures to see plenty of work this week with Gore on Injured Reserve, but be careful with Ballage. Jacksonville isn’t quite the defense we saw in 2017, but they’ve still been very tough on the run. Sure, Derrick Henry put up his massive game in Week 14, but other than that, the Jags have shut down the run game over the last two months. This game is an ugly duckling, with Cody Kessler the third-least-efficient quarterback since taking over as the Jaguars starter going against Ryan Tannehill, who leads the league in turnover-worthy play rate. Give me the team getting points here in Jacksonville to lean on their defense and do just enough offensively to lose by three or less. McGlinchey has three separate games this season in which he didn’t allow a single pressure. The 49ers look like they found themselves a player in rookie wideout Dante Pettis. Over the last three weeks, Pettis has notched three touchdowns and ranks fifth among wide receivers in fantasy scoring over that span. While the numbers are encouraging, Pettis gets a major downgrade this week against the Bears. All three of Chicago’s starting corners ranking in the top 20 in PFF grades and Chicago allowed zero touchdowns to the Rams and Packers receivers over the last two weeks. Arizona’s 69.1 team pass-blocking efficiency is dead last in the NFL. With James Conner looking unlikely to play, we can expect Jaylen Samuels to again serve as the lead back for the Steelers. Samuels is certainly in the RB2 conversation, but don’t expect him to repeat last week’s rushing outburst. New Orleans has been one of the stingiest rushing defenses this season and currently allows the fewest rushing yards per game at just 79.1. Lattimore is allowing a 68.2 percent catch rate this season after allowing 53.8 as a rookie. Wagner now has 113 tackles on the season without a miss. The Seahawks have pounded the rock on the ground this season and enter the week as the league’s top rushing attack from a statistical standpoint with a massive 154.9 rushing yards per game. That’s good news if you’re a Chris Carson owner, as is this week’s matchup. Kansas City allows the most fantasy points per game to running backs and has surrendered a rushing score to each of the last three backfields they’ve faced. Miller is on pace to break the PFF record for sacks allowed in a season (14 already). Phillip Lindsay’s remarkable season continues into fantasy championship week with a plus matchup on tap against the Raiders. Linsday is a Monday night hammer against this Oakland defense that just got lit up by Joe Mixon in Week 15. Running backs have found the end zone four times over the last three weeks against Oakland. Lock Lindsay in as a top-10 play this week.